It’s a simple question, with a not-so-simple answer. For many of us, debt began when the money we had didn’t stretch to the life we want. Whether our debt was born out of necessity or frivolity, debt has now become the norm in the UK. Now, the average UK household debt stands at £15,400. We often say that we got into debt to buy an item or fund a purchase. And that’s true; the things we bought on credit got us into debt. But we neglect to notice the external factors that contributed to the decision to buy, and buy on credit. We forget the fact that we were pushed, prodded and persuaded into buying the thing in the first place, through marketing and advertising. All of us gloss over the constant stream of credit offers that bombard us through our mailboxes (post and email). We ignore how often we are offered debt when we go to make a purchase. So what we bought on credit is only a small part of the story. With that said, how did you first get into debt? Was it really your choice, or were you influenced, cajoled or encouraged? I got into debt during the Autumn after I turned 18. I signed up for a credit card in my local shopping centre, as I finished a shift at my part-time job at a supermarket. With my holiday planned in a few weeks’ time, I thought that my new credit card would be handy to fall back on in case of emergencies. The limit was £800. To this day, I couldn’t tell you what I bought with that money. Probably the same thing any typical 18 year old would; clothes, shoes, going out. By the New Year, I was at my limit. So what did the credit card company do? They increased the limit by more than 700%, of course. And so began the next 13 years of my life, relying on debt to bridge the gap between what I could afford and what I wanted. Unfortunately, during those 13 years, I was a marketer’s dream. I bought whatever was marketed to my demographic. I’m not saying that I’m not at fault. I always pulled the trigger on my financial decisions. But during my twenties, there have been a lot of times where marketing told me what I needed to be complete and I believed it. And then debt came along and paid the bill. Until it was my turn to chip away at the minimum payments, at which point I was on my own. For many of us, we have a devil on each shoulder. One is marketing and advertising, promising that we will somehow be complete when we obtain whatever they’re selling. One is debt, giving us permission to spend. The problem with debt is that it’s thrust upon us even we don’t want it, or are not actively seeking it. We should have a #MeToo for credit. For example, there was that time I worked in a clothes shop and we were targeted on the store card applications that we needed to reach each week. Sometimes we couldn’t meet our targets organically so we were encouraged by management to submit applications in the names of friends and family. And then of course there were the times that, as a customer, I’ve been offered a discount or incentive to put my purchase on store credit. Or the times that it was forced upon me as a condition of purchasing a product. Then there was the time I was told that I couldn’t apply for a loan without taking out Payment Protection Insurance (which is false, FYI). And don’t forget when I was finally getting out of debt and my loan provider didn’t like it. They sent me several emails and letters over the year that I was paying off my loan to persuade me to “top-up” (i.e. borrow more). The point is that, in the majority of cases, we are willingly applying for credit. But if it wasn’t so easy to apply for, if it wasn’t right at our fingertips, if it wasn’t encouraged and incentivised, would many of us be in debt? 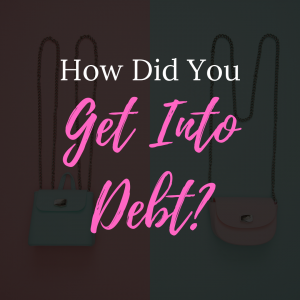 I put out some relevant questions on my Instagram stories a while ago regarding how we get into debt. Half of those that answered indicated that they first got into debt before turning 20. While not many people said that they’d taken out debt on a whim, several had felt pressured into taking out debt. Many people said they would give everything that they bought using debt back in order to be debt free. And as a whole, those that responded felt that credit providers were irresponsible in offering credit to customers. We are a society built on debt. In fact, many non-financial sectors now rely on customers getting into debt as part of their business model. How many people could actually afford to buy a car or some furniture if they weren’t offered a credit facility to pay for it? We’ve also changed our perception of debt. With debt normalised, alarm bells don’t ring when we start ’em young with a credit card at 18. Or let home owners borrow more than their house is worth. Or offer credit to pensioners. Social media plays a part in our debt decisions. The (curated and filtered) lives of celebrities and influencers have warped our own expectations of the quality of life we deserve. In fact, my poll indicated that many people feel that social media helps to shape our spending habits. But social media isn’t just the host to celebrities and influencers, but the people we know, too. We now get to see a glimpse into the lives of our friends, families, colleagues and acquaintances. The problem with this is that we only see what they want us to see, and we never get the true picture, including how much debt they’re in. As a result, we feel pressure to “keep up”. And often, we are keeping up with someone else’s pretence; we are envious of a life that doesn’t exist. Because of this, we finance cars because we think it’s normal for a twenty-something earning £20k per year to own a new BMW. We renovate our homes in grey crushed velour, feature walls and extensions, because we think it’s normal that first time buyers (who have just stumped up a crippling deposit) can afford to live in designer digs and still make mortgage payments. We plan huge weddings, expensive holidays and brunch because that’s what we see. It’s perceived by many as the norm, when it’s not. 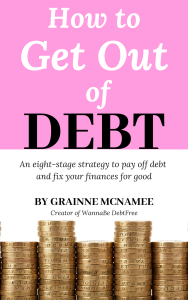 We often ask ourselves (privately, but it’s also a commonly-searched Google term, so I know y’all are looking) ‘how much debt is normal?’ Of course, this is subjective, but much of the advice out there is to ratio your debt against your income. If your total debt exceeds your annual income, start to worry, the advice offers. The problem with this advice is that that many of us have vicarious employment situations, temporary jobs or zero-hour contracts. How can we leverage our income to facilitate long-term debt when our income isn’t guaranteed? We also have little guidance or regulation when it comes to debt. Being financially savvy means knowing how to tart credit cards, how to get the best 0% credit deals, and sourcing the best deals. But as for financial education for children, or guidance for the rest of us? Forget it. I think so. Having paid off my £16,000 debt last year, I can tell you that having no debt is a privileged position to be in. One without the requirement to earn a certain amount to service my debts (£410 were my minimum payments previously, which was nearly as much as my mortgage). Simply put, to get out of debt, you need a budget and a plan, and to stick to both. Think of those two devils perched on each shoulder. You need to drown out the marketing and advertising. Stop listening to that artificially-created niggle telling you that if you had this or that, you’d somehow be happy. Don’t believe it. Remember that the things you financed that promised to make you happy have actually made you unhappy by increasing your debt. Once your marketing devil is muffled, your debt devil should suffer a similar fate. Very few people are going to take out debt without a motive, so focus on cutting out the need to purchase as a starting point. To really incite change, you need to educate yourself. Be aware of your spending triggers. Know how much you’re throwing down the drain in debt interest every month. Figure out how many hours you work just to pay the minimums on your debt. Get angry at both how much money you waste on interest, and how many hours you work just to pay for the privilege of debt: you weren’t born to just pay bills and die. How you first got into debt requires some not-so-simple analysis. But wouldn’t it be nice to conclude it with how you got out of debt? Now, that would be priceless. 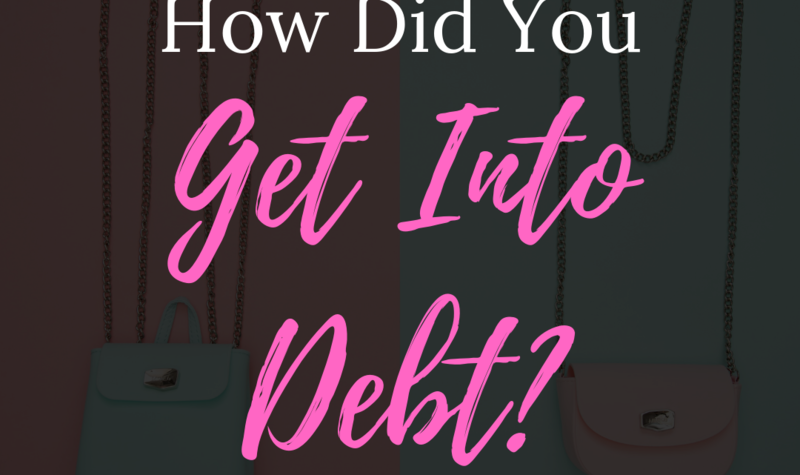 Comment below and tell me how you first got into debt.